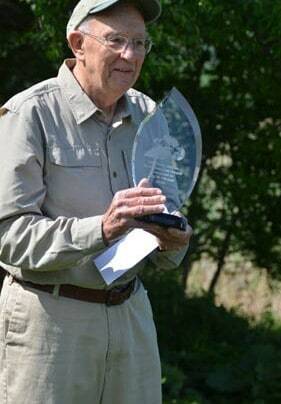 Roy Pilcher, who founded Rutland County Audubon and has served as president and in other lead roles for more than 40 years, was presented with the award during a ceremony at the West Rutland Marsh, an Audubon “Important Bird Area,” a designation Pilcher was instrumental in obtaining. The annual award, named for famed osprey advocate Meeri Zetterstrom, comes with $2,500 to support Rutland County Audubon’s ongoing work. Pilcher, who was nominated by Marvin Elliott, helped found Rutland County Audubon in 1974 and led the effort to designate the West Rutland Marsh and the Lake Bomoseen and Hubbardton marshes as Important Bird Areas. He was also a key leader in the creation of the West Rutland Bridge-to-Bridge Interpretive Trail, chairs the local Christmas Bird Count, and is an active educator, working with children and adults. “By teaching people to understand what they are seeing in the environment, Roy has helped broaden the understanding of environmental issues and values for thousands of people over his lifetime,” Elliott said. The award, first presented in 2010 shortly after Zetterstrom’s death, was created to honor her legacy and recognize others who follow her example. Past award recipients include Sally Laughlin, a leading wildlife advocate and scientist whose work was instrumental in restoring three species of endangered birds in Vermont; Michael Smith, the founder of Rutland’s Pine Hill Park; Margaret Fowle, who led Vermont’s peregrine falcon restoration program; the Lake Champlain Committee, which for five decades has used science-based advocacy, education and collaboration to protect and improve Lake Champlain; and Kelly Stettner, who founded the Black River Action Team, which protects the Black River in southeastern Vermont.